I had the pleasure of decorating for the occasion. However, I had a few dilemmas to take into consideration. The party was held in the afternoon at the elder care home where she resides. This meant that we couldn't set up until after lunch was over and cleaned up, and it had to be taken down before dinner could be set up. So whatever I did had to be done quickly. Since 105 is a monumental year, I decided the number should be the theme, so to speak. It was found on the cake, candles, balloons, and flower arrangements. Yellow and Gray seemed like a perfect combo to fit the happy occasion. In an Earth Day post last month, I gave a tutorial showing how I made the containers for the flower arrangements. However, I used oatmeal canisters instead of the cans in the tutorial. You can catch up on the how to here: Recycled Crafting. I created four flower arrangements in the oatmeal canisters. This way I could just set them on the table, rather than arrange something on site, since I had limited time. I used yellow streamers as an accent ribbon and birthday cake embellishments. 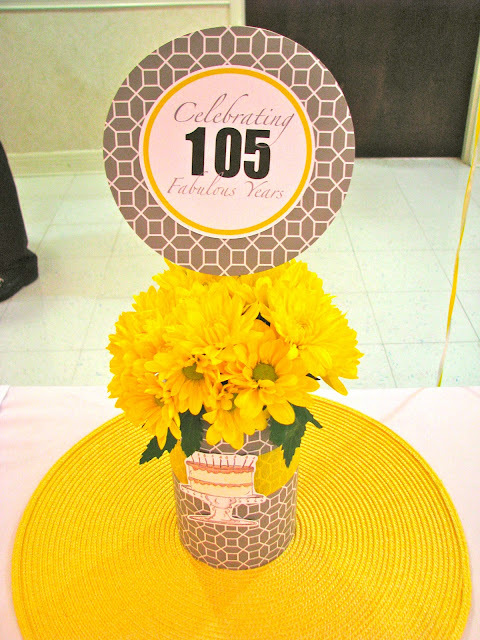 I then added yellow flowers and a coordinating sign which said, "Celebrating 105 Fabulous Years". I used yellow circular place mats to give a pop of yellow under each arrangement. I also had several clusters of yellow, gray & white balloons at the ends of the buffet table. We had such a great time! The local paper even did a great article about my grandmother and her celebration. 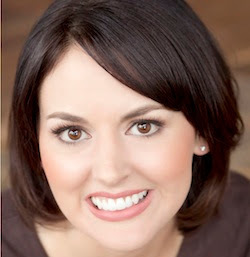 What a blessing she is to us all!